Leena Adesara is a UK National Make Up Artist, visiting Australia to work exclusively with the Illamasqua team in Myer’s Sydney City store. 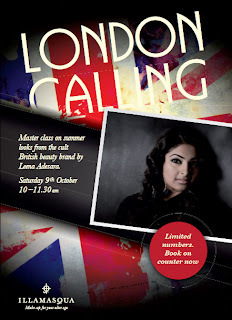 On Saturday 9th October from 10-11.30am, Leena will be hosting a masterclass on summer looks, bringing with her the latest make-up creations that have been rocking the UK, just as it begins to hot up in Australia. The master class booking fee is AUS$70, which is entirely redeemable against Illamasqua product purchased on the day. Bookings can be made on the counter, or by calling 1800 661 210.